The Lunar New Year celebrations are upon us once again. In true Wargaming style, we're rolling out a series of discounts and missions to keep you occupied throughout this festive period and increase your capabilities in the battlefield. For a start, sales on equipment and consumables are back up, along with a discounted price for barracks and garage slots. The entire Chinese Tech Tree is also available for cheap - you'll find it easier to expand your collection of Chinese vehicles for this special! There's also a new mission series featuring the Chinese Tier VIII 112 heavy tank. This powerful machine can be redeemed with tokens that you'll receive as mission rewards, or purchased from the Premium Shop. Collect a set, then exchange it for a shiny new addition to your garage. Limited-time offer: Convert Free EXP to Crew EXP! 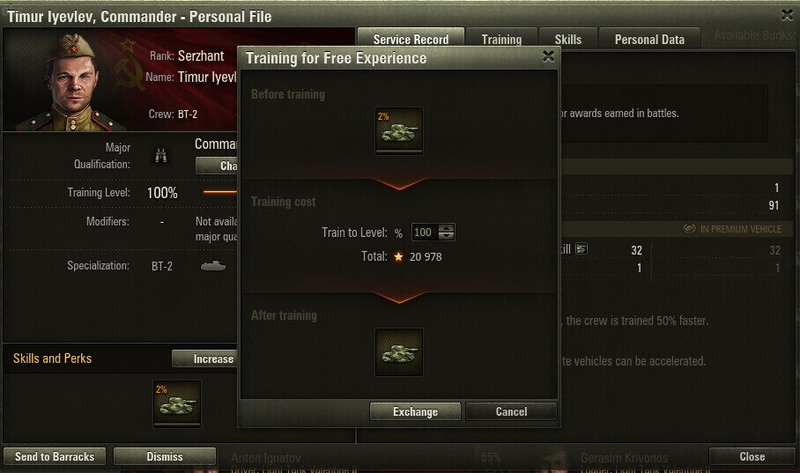 Lastly, we're excited to announce that for the first time ever in World of Tanks, you'll now be able to convert your Free EXP directly to Crew EXP and training up your crew. 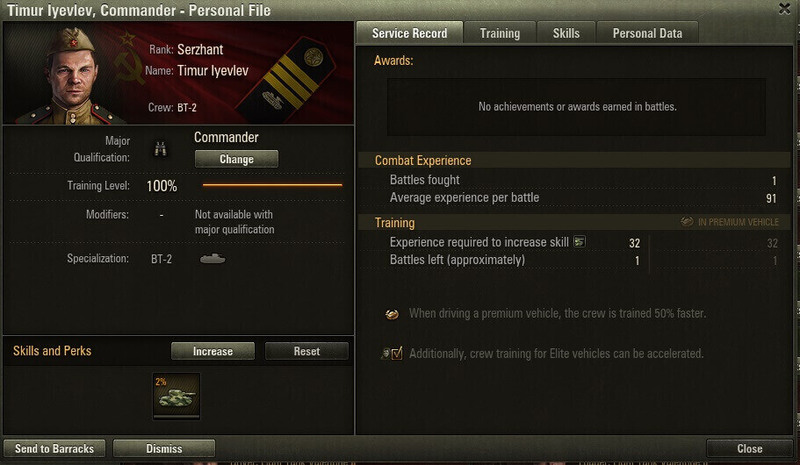 To do this, simply access the Personal File of the crewmember you wish to spend your Free EXP on and click on the 'Increase' button at the Skills and Perks section. This function won't be around forever, so make sure you convert as much Free EXP as you need before it's gone! Note: The exchange rate is set as 1 Free EXP : 5 Crew EXP. Enjoy your Lunar New Year celebrations! A Lunar New Year-themed garage will be available during this period. Collect all 7 Challenge Tokens to receive a free Tier VIII Premium heavy tank. Deal 80,000 damage and destroy 80 enemy vehicles while using a Tier 6 or above Soviet vehicle. Deal 80,000 damage and destroy 80 enemy vehicles while using a Tier 6 or above German vehicle. Deal 80,000 damage and destroy 80 enemy vehicles while using a Tier 6 or above American vehicle. Deal 80,000 damage and destroy 80 enemy vehicles while using a Tier 6 or above French vehicle. Deal 80,000 damage and destroy 80 enemy vehicles while using a Tier 6 or above British vehicle. Deal 80,000 damage and destroy 80 enemy vehicles while using a Tier 6 or above Chinese vehicle. Deal 80,000 damage and destroy 80 enemy vehicles while using a Tier 6 or above Japanese vehicle. Free EXP can now be converted to Crew EXP for a limited period. The exchange rate is 1 Free EXP : 5 Crew EXP. Access the Personal File of the crewmember you wish to spend your Free EXP on. Click on the 'Increase' button at the Skills and Perks section. 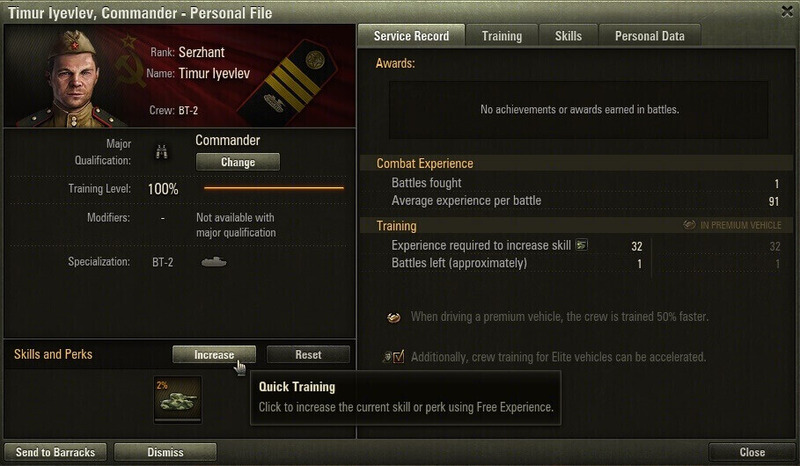 An exchange menu will appear, where you can specify your crewmember's ideal training level. The amount of Free EXP needed will be displayed below the box. Click 'Exchange' to complete the process. Available from 19 - 23 Feb only. Deal at least 100 damage while using any Chinese Tier II - V regular vehicle. Deal at least 100 damage while using any Chinese Tier VI - VII regular vehicle. Deal at least 100 damage while using any Chinese Tier VIII - X regular vehicle. Must deal at least 100 damage to qualify. Available from 18 - 20 Feb only. Available from 20 - 23 Feb only. Available from 23 - 27 Feb only. Available from 27 Feb - 2 Mar only.